Here’s what I mean: Even as the impacts of climate change accelerate all around us with devastating impacts (this was, for example, the third once in 500 year storm to hit Houston in the last 3 years) they always hit the poor, communities of color, and the disenfranchised first and worst. There’s a reason that the people who lived in New Orleans’ lower ninth ward ward were mostly black, and the worst hit by Katrina’s flooding 12 years ago. There’s a reason why the people living next to flooded chemical plants and refineries that are leaking and spewing toxic gasses are mostly Latino and black. And there’s a reason that climate impacts like rising sea levels, more severe storms, and increased rainfall and flooding disproportionately impact people in the global south, and poor and minority communities here at home in America. Saying so is fine and necessary. 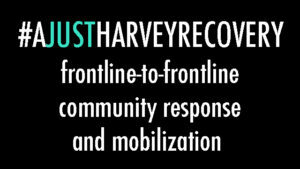 But understanding that Harvey, and all climate chaos, cary a fundamental racial and political bias is also necessary to how we respond. During and After Katrina, the Red Cross drove empty trucks around to make it look like they were busy, and raised millions of dollars that were never spent on the people who needed it most. Its just one of several examples of how that charity, in particular, mis-manages donations. Just as important, after Katrina had passed, New Orleans was gentrified, it’s school districts privatized, and it’s reconstruction benefited many of the same developers, oil, and gas companies that made a climate-fueled super storm such a disaster for the city in the first place. Which is why we’re asking you not to give to the Red Cross and other big charities in response to Harvey. Instead, we’re directing you to a consortium of local, frontline groups fighting climate change and environmental justice fights in and around the gulf region. Our goal is a #AJustHarveyRecovery – not just a new beginning for people’s who’s homes are flooded and who lost loved ones in the storm; But a new start for the region that shows Another Gulf Is Possible. So here’s a full list from Our friends. If you’re not sure how to split your donation over these groups, or only have a minute – you may also donate on this page we setup, and we’ll divide 100% of the donations evenly between TEJAS and the L’eau Est La Vie camp‘s pages, since we’ve worked with both groups in the past. 7-10pm Tuesday will be their normal monthly fundraising concert ($6 at the door including refreshments & music) and any donors will receive a ticket for a door prize. They are loading Thursday afternoon and evening and should be prepared to leave early Friday morning. Please contact jayeesha@gmail.com if you would like to be shared on the collaborative Google document serving as the central source for content here.